Water Tank level control & Reaction Vessel with sensors to detect different levels of water and switch off the water supply (Logic Controlled). This Module is provided along with the water tank and sensors, required accessories. Reaction Vessel to control the temperature of water set by the Thermostat at a particular temperature by the user. Seven segment display simulator for displaying a message. 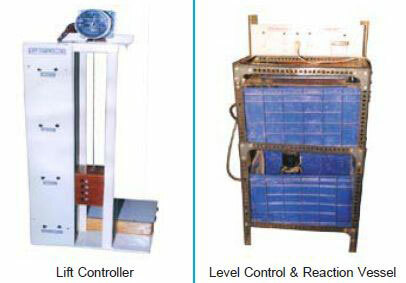 Lift control with experimental model of lift which is truly operational, totally controlled by manual switches to select the floors. Sequential switching of motors with two nos. of 220V AC/5A output to connect motor (motor not provided). Conveyer Belt System and Pneumatic Control 3 cylinders with optical sensor and conveyer belt.